Almost two weeks ago we experienced the most spectacular lightning storm we have ever seen and the result was over 100 wildfires started in Yakima, Wenatchee, and closest to us at Table Mountain. The first week we mostly experienced smokey air not quite as bad as what we had during the Taylor Bridge fires but enough to keep the boys and I inside when the air was stagnant. We saw hundreds of firefighters camping out in our favorite local park but we didn't see any actual fires. Last night that changed when just as we were commenting how clear and breathable the air was what had been a hazy layer of smoke covering the top of the mountain turned into a large cloud of smoke with flames rising up from behind the Mountain. 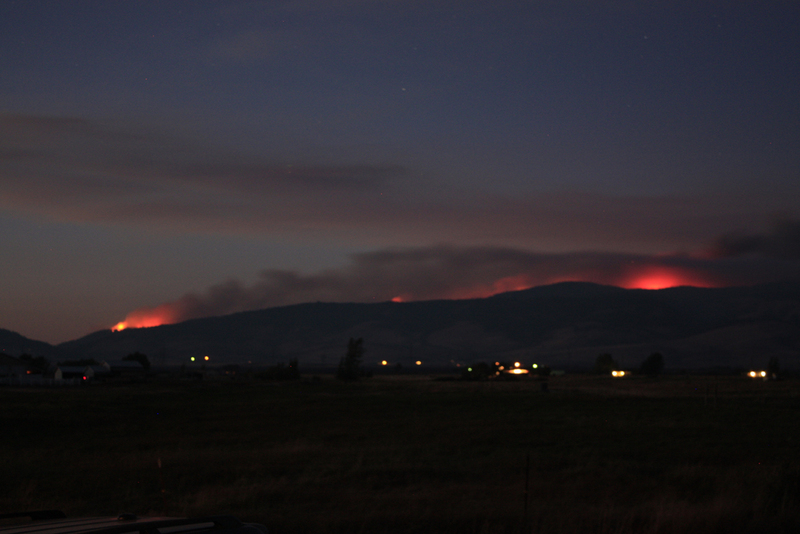 As the cool night winds started to gain speed we saw almost all of Table Mountain framed by fire. As of this morning we can no longer see any flames on the mountain but the smoke is thick enough to obscure the skyline. We are in no imminent danger but we are praying to the rain gods for some much needed precipitation. Last Sunday we took a break from farming projects and went to the Kittitas Valley Threshing Bee at the Olmstead State Park. The highlights was definitely the antique tractor parade but we also got a chance to see wheat being threshed the old school way, wandered around looking at all kinds of 19th and 20th century technology that people have meticulously kept in working condition, and experienced the Olmstead Homestead which is on permanent display at the park with the families original cabin built in 1875, their farmhouse, and farm equipment some of which is in working condition and some of it looking as if it is slowly melting into the ground.